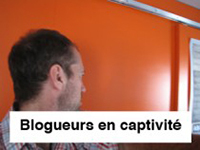 Folie/Culture and Bang Centre were thrilled to present Blogueurs en captivité (Bloggers in Captivity), an in situ performance on tour in Saguenay! 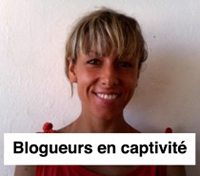 Two artist/bloggers, Alain-Martin Richard (Quebec City) and Stéfanie Requin Tremblay (Saguenay), spent three days imprisoned in their respective glass cages at Place du Citoyen, an intense experience of alienation. Stéfanie Tremblay is an emerging artist who pens self-deprecating observations on daily life and strives to make her life a compelling storyline fuelled by pop culture, the internet, and rock music. This project was made possible by the financial support of the Conseil des arts et des lettres du Québec. 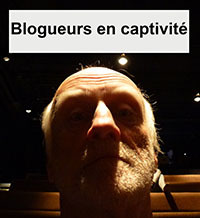 Folie/Culture and Bang Centre were pleased to bring Blogueurs en captivité (Bloggers in Captivity), an in situ performance, on tour in Saguenay! 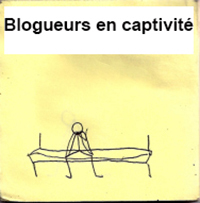 Two artist/bloggers, Alain-Martin Richard (Quebec City) and Stéfanie Requin Tremblay (Saguenay), spent three days as captives in glass cages at Place du Citoyen, an intense experience of alienation. 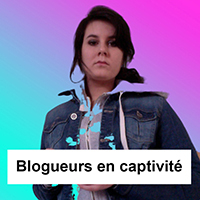 Folie/Culture teamed up with DARE-DARE, a Montreal multidisciplinary artist-run centre, to present Blogueurs en captivité (Bloggers in Captivity). Invited artists Adam Bergeron (Quebec City) and karen elaine spencer (Montreal) accepted the challenge of being held captive and experiencing alienation for the three-day event, held on the esplanade of Saint-Laurent Metro station. karen elaine spencer is an established artist who shows her work in venues ranging from established galleries to the street to online spaces. Her work calls into question the inherent hierarchy in our values, and examines how, as ephemeral beings, we occupy the world. Two artists-in-residence are held captive in a waterproof and totally transparent bubble. Will isolation bring them into closer harmony with the world? Invited artists Martin Dufrasne (Montreal) and Sarah L’Hérault (Quebec City), agreed to take the challenge and experience alienation during the three-day event held at Place de l’Université-du-Québec. Martin Dufrasne’s art questions notions of value, exchange, and transformation. A major event in art and mental health, DSM-V+ dévidoir de syndromes magnifiques brought together some hundred guests in Québec City from October 11-16, 2006. Five days of lucidity, during which the guests, seeking truth, came to jostle, turn upside down, and criticize what is generally accepted in the DSM (Diagnostic and Statistical Manual of Mental Disorders), the worldwide reference in the classification of mental disorders. 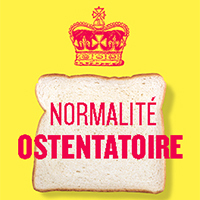 The guests, from Québec, Canada, the U.S., France, Germany, Finland, and Great Britain, approached new strategies that treat — figuratively and literally — the pathology of the living. They explored the tendency to “pathologize” the living being in all its manifestations during debates, exhibitions, lectures, round table discussions, projections, theatrical creations, manoeuvres, and festive gatherings presented at this event. From November 10 to November 20, 2001, four invited artists were given carte blanche to examine the question of restraint or psychiatric isolation. The artists proposed a manoeuvre which was sequentially and continuously revealed in three different media: the daily newspaper, Le Soleil, the sky over Québec, and our site on the web, as well as from a vehicle moving through the streets of Québec. 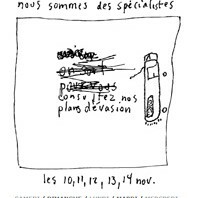 Following the Summit of the Americas, which was held in April 2001 in Québec, and in wanting to take part in the mass movement that it produced, Folie/Culture invited 10 artists from Québec to create 10 demonstration Kits which were portable and reusable. 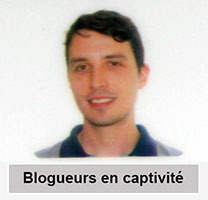 They offered anyone who was interested in demonstrating the possibility of doing it in an unusual way. With this project Folie/Culture continued its mission of merging art and madness. Each one of the public presentations of one or more of the Kits, becomes an engaged travelling exhibition, a visual reminder that the organisation supports an individual or collective social action that touches it directly or indirectly in its work of raising awareness. 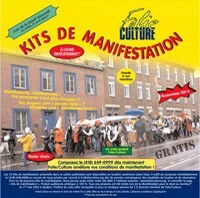 The 10 Kits de manifestation presented here can only be borrowed (no charge) from Folie/Culture. The Galerie d’art virtuelle Folie/Culture presents the works of 15 Québécois artists for whom creation remains the preferred entryway to daily happiness. These artists, by and large unknown to the general public, have an important impact in their immediate social environment. They do not have access to the means of distribution and recognition available to professional artists. Their production which is often dense, iconoclastic, and sensitive refreshes our view and renews our aesthetic appreciation of the work. With Jean-Claude Bélanger, Andrée Bourret, Marie-Andrée Conroy, Serge Demers, Jacques Dion, François Ducas, Francine Émond, Francine Fortier, Gaëtane L., Martial L., Antonio Mazza, Steven Neill, Pascal Parthenais, Normand Roy and Ruth Veilleux.